My stained glass pieces are original creations that begin with my deep and heartfelt connection to nature and the environment around me. Many of my pieces reflect the magnificent mountains of Colorado, the area where I am blessed to live. As a stained glass artist, I love that each piece of glass is as individual as you and I; no two pieces are the same, just like snowflakes or fingerprints. My greatest joy in working with glass is creating a personality for each panel. I do so by weaving a beautiful tapestry of colors and textures to create the whole so that one can look through from the inside to the outside and feel connected to all. Glass Eye 2000 has changed me as an artist and given me incredible freedom in my work. I used to believe that I couldn't draw. Now I am able to put my vision right into the program and then modify sizes and shapes with the click of a button, rather than having to erase and start over. Glass Eye 2000 changed my approach to the way I design stained glass and, since that time, I have become freer in my visions and my panels and designs have become larger and more intricate. 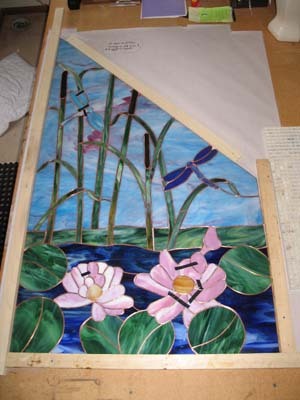 This cattail panel was commissioned by friends and inspired by a pond in their backyard. They wished to create a privacy window between their neighbor's house and theirs, while still allowing sunlight to come through. At first the design was small, just enough to block the neighbor's view. But soon the piece took on its own personality and continued to grow in size. The panel I created is a trapezoid, mimicking the shape of their window and measuring 55" x 30" x 22" x 41". 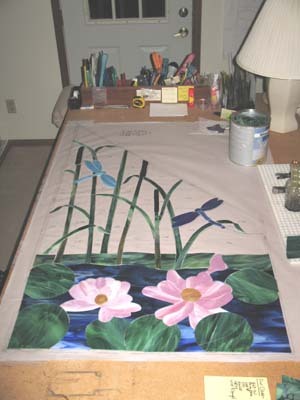 The design focuses on my friends' love of their pond: the peaceful water lilies, the cool blue of the water, and the birds and insects that frequent the pond on their path of migration. They also wanted to include cattails and dragonflies, items not in their pond but things that brought them joy from other ponds they visit. I love to work with bright colors and thus maintained the vibrancy that is reflected in the world outside their window. The window faces southeast, so the colors are even more enhanced with the sunlight streaming through. One of my friends also gave me some glass that her father used when he used to do stained glass and I incorporated a few of those pieces into the panel. As the design unfolded, so did the details. I used the copper foil method, as I feel it’s easier to incorporate smaller details into the panel. I am very thankful for Glass Eye 2000, as I cannot imagine designing a piece like this without the help of the program, especially with the shape of the window being so unusual. As my friends began to see the design come to life, they added more and more details. It was so easy to make the changes with Glass Eye 2000, including emailing them multiple designs with alternate glass choices. Another wonderful Glass Eye 2000 function is the ability to import a photograph into the program and overlay the design into the window of the photograph. This way my friends were able to get a visual perspective of how the piece would actually look in their home. We printed out a copy of the panel from Glass Eye 2000 and hung it in their window to see how they would like the final size. As the panel began to grow in size, we looked at the structural requirements of the pieces. Those especially vulnerable to cracking were the long pieces of grass and the stems of the cattails. I opted to break them in a way to enhance the look rather than detract from it. The other challenge was the sky and how to cut the glass so that all of the sky pieces flowed from one piece to another. I purchased a 30" x 33" piece of glass, which was the perfect size for the sky. I used my ring saw to cut many of the sky pieces, not so much because of their difficulty, but in order to get the flow of glass desired for the look of the sky. The sky turned out extraordinary! A frame in the shape of the trapezoid window was constructed on my table and the pieces were cut, foiled and laid out. For patterning, I use Mylar as it can be traced on with a felt tip pen and the lines remain permanent. Due to the size, rebar reinforcement was used across the top line of the ground portion of the landscape. The lines of the ground were changed for ease of use of the rebar. After the piece was soldered, patina was applied and the piece was cleaned and polished. The piece was then framed in ?" zinc and framed in 1½" oak. The panel will soon be hung in the window of my friends' home and they are excited to see the sunlight shine through, with the glass colors and textures shimmering for everyone's delight. 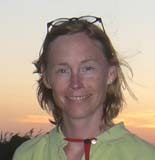 Lisa Kenny fell in love with stained glass when she was seventeen while working at a cider mill in Michigan, as her favorite gift items at the mill were pieces made of stained glass. She was fascinated by the way lead was twisted to make vines, the round globs that formed clumps of grapes so purple you could almost taste them. Seven years ago she opened her own stained glass business, Azure Sky Stained Glass Studio in Evergreen, Colorado, and does commission work and gifts for family and friends. Lisa’s photo was taken at the Black Sea, near Bucharest, Romania, where she was visiting a fellow stained glass artist and new lifelong friend she met in the Glass Eye 2000 discussion group. You may contact Lisa via email.